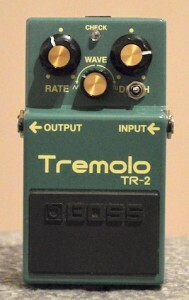 As mentioned above, I originally passed on the TR-2 because it had a perceived volume drop when engaged. I later bought one anyway, to use on my small rehearsal/to-go pedalboard, and modified it to have a better output level match. The pedal has a three-way switch which selects (you guessed it!) three different output level settings. The pedal now goes from ”slightly above unity gain” to ”quite a bit more” in three simple steps 🙂 It should be mentioned that TR-2’s made after mid-2006 (marked with RoHS stickers) have a higher output level from stock, so the volume drop issue is not as big a problem with those. I also briefly owned a Boss PN-2 Tremolo/Pan, and while the panning effect was really cool, I found the tremolo to be too choppy for me – I prefer the Fender amp tremolo sound, which the TR-2 does very well. The Trelicopter comes with a bunch of different opinions with regards to its output level – some say it has a definite volume drop when engaged, while others claim it has a quite large volume boost. I found it to be just about perfect with the tremolo set to ”normal” settings (not too fast, not too deep). Of course, since tremolo in itself is an effect that spends part of the time lowering the volume, you have to compensate for that somehow. I would have preferred if the pedal had a volume control, but they instead opted for trying to find a fixed balance. This means you’ll get a volume boost when the intensity is set low, and a volume drop with it set really high (especially if the speed is also turned up). 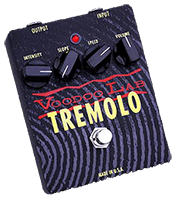 At the settings I ended up with, the level was just a tad too high, so I went back to the Voodoo Lab Tremolo. When/if I get the time, I might look into making the output level adjustable on this one, although even fitting a trimpot – let alone a real pot – will be a challenge! I did one small mod to it (if you can call it that) – I added a tiny drop of white-out in the little pointer slot on the two tiny knobs, which made it much easier to see where they’re set. Impressed as I was with the Trelicopter, I decided to order in a couple more Mooers that my local store didn’t have. One of them was the Ensemble King chorus. Now, there’s tons of discussion forum threads about which classic circuits Mooer copied for their Micro Pedals line, and while some of the info seems right (the Trelicopter does sound like a Tremulator, and the Black Secret is most definitely a RAT), this one is a little harder to pin down. ”Ensemble” seems to hint at the venerable Boss CE-1 Chorus Ensemble, but that one only had a single ”intensity” control for the chorus. 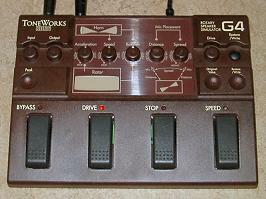 Others point towards the CE-2 (since it has both speed and depth controls), but it didn’t have a level/mix control. Set that knob to max, though, and you can absolutely hear a resemblance to both of them. But it doesn’t really matter – this one is seriously good on its own! The level control allows you to mix in just the right amount of chorus with the dry signal, keeping it just on the right side of ”too much” (which I sometimes feel both the CE-1 and CE-2 can be). Again, I used the white-out trick to give the small knobs a white pointer line. Just dab it in (don’t worry about spilling over on the top, but try to keep overflow away from the grooves in the sidewalls) and when it’s dried, scrape any excess off with a sharp knife. A true classic – the SCF has been around for ages, and in some respects it is still unbeaten. They used to market it as being studio-quality effects in a pedal, and I think it is still true. The chorus is lush, without being overpowering. And as you can set the amount of chorus relative to the dry signal, you can get as 80’s (or not) you like. I got this on eBay UK (as it is mains-powered, buying one from the US wasn’t an option), with a UK mains plug. I ended up replacing the mains cable completely, to get a slim molded euro 2-prong plug on there. We don’t provide DIY support. We don’t have any techs around who know these old pedals. Well, in their FAQ section, they do mention adding 1M resistors to the output jacks to stop it popping when using an external true bypass loop box, so someone obviously knows something… But in my case, as the voltage leaking was so big, 1M resistors didn’t do much. I believe I eventually had to go down to around 300K or so for each jack, to handle the leak and stop the pops. 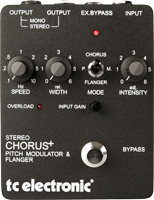 Eventually, I got it working without issues, and it is the best chorus pedal I have ever owned… with the ”intensity” (mix) knob set around 2, I get just the right amount of chorus for clean playing, without it being overbearing if I happen to step on the pedal during a solo. It is an awesome chorus, simply put. Removing the feedback resistor (labeled R28 in the modern reissue pedals) brings the circuit closer to the original MXR script logo pedals’ sound. 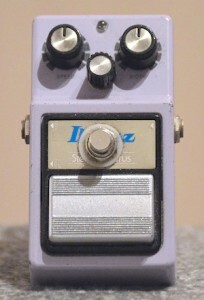 But not all the way – the script logo pedals had a different circuit altogether. 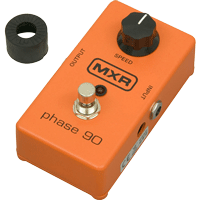 But it’s as close as you will come, without buying the MXR 1974 Vintage Phase 90. The Custom Shop Script (CSP101SL) version is good, but in no way ”vintage” – it is simply an EVH phaser in a vintage-looking box. For my money, if I can’t have a vintage one, or the 1974 Handwired model, I’d just as well have a regular M101 with a simple mod. This pedal was given to me, together with an old DOD 270 A/B box, by a close friend who stopped using it when it broke down somewhere in the ’80s. It was a bit beat up and rusted, but after afternoon of tinkering it was up and running. The Jet modes still don’t work properly – I think the “jet level” pot is busted – but the regular phase modes are dreamy. To my amazement it had a factory installed DPDT switch, and was wired for true bypass! Plus it has a fast/slow stomp switch, and when you change speeds, it ramps up/down like a leslie… It stole a bit of gain when kicked in, though, so I set about raising the output gain. I did, and in the process the whole effect became much more vibrant and defined. The gain went up just a tad too much, though, so I’ll eventually have to put it back on the workbench to tame it just a bit. 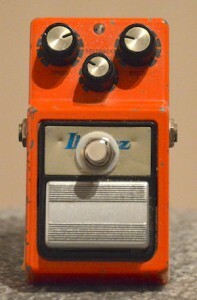 I don’t use this pedal live anymore, but it will sometimes make an appearance in recording sessions. I got this from a guy in California, from who I was originally only going to buy a used Boss Blues Driver. I noticed that he also were selling this ’80s phaser pedal, and the ”what-the-hell” reflex kicked in. So I simply said ”what the hell”, and had him send me this one as well. It’s a little scuffy, and the switch was quite hit-and miss. But it sounds nice – more shimmery and hi-fi/post processing-sounding than a Phase 90. It’s a nice smooth phaser, basically. I ended up stealing its bottom plate to fit to the TS-9, so when I decided to use this one on the board, I had to fabricate a bottom plate for it. I also modified it to true bypass, since I knew it would spend most of its time sitting bypassed on the board (I tend to use phaser as a ”once or twice per gig” effect). I have a real leslie cab (Fender Vibratone), but felt there would always be moments where I wanted the sound but couldn’t find room on stage for the real thing. Dave Fox of Foxrox Electronics kept raving about the Korg G4 – an older leslie simulator – so eventually I caved, and located one via eBay Germany. It cost me 120 € + shipping, but that’s ok – these puppies go for way more than that these days… It’s not a permanent fixture on the pedalboard, partly due to its size and partly because I sometimes actually bring the real deal to gigs. Instead, I keep it on a separate pedalboard together with a true bypass loop box, and simply patch it in between the main board and amp. Anyway, the G4 was introduced in 1994 as part of the ToneWorks line, and does a great impression of a Leslie 122/147, complete with the frequency hole between the horn and woofer – a feature of the original that is often overlooked. I won’t go into too much detail here, but the crossover network in a Leslie cabinet splits the signal to the horn and woofer at 800Hz, while the horns’ frequency range starts at 1000Hz… This mismatch is a vital part of the leslie sound – it’s what causes the horn to growl so nicely (due to it being asked to reproduce frequencies it can’t handle), and it also leaves a ”hole” in the frequency response around 800Hz. The G4 mimics this perfectly, plus it has a ”Drive” section to capture the fat, growling sound of a tube power amp being asked to do more than it’s capable of. Not bad at all. This one is quite an oddball… What ever possessed Danelectro to include a leslie/rotating speaker simulator in their line of mini pedals is a mystery – considering how small that market must be – but there it is. I had been wanting to try it ever since I first heard about its existence, but wasn’t able to locate one here in Sweden. I finally got my grubby hands on one, when a friend went to the US on holiday and was kind enough to bring one home for me. Musician’s Friend had them on sale, so it ended up costing a mere $20… Now, that’s a bargain, if I ever saw one! So what’s it like? Well, I’m utterly amazed at how well this little thing does the single-rotor Leslie 16 / Fender Vibratone sound. As opposed to other – more expensive – simulators, this one doesn’t allow for the ”horn” and ”woofer” to spin at different speeds. Instead, when the Rocky Road spins up to speed, the whole frequency range accelerates uniformly – just like a Vibratone does. This is probably more due to design limitations than any specific goal set by the design team, but it still places the Rocky Road in a class of its own. The other simulators I’ve tried – H&K Rotosphere, Korg G4, Voce Spin etc – are all very good at sounding like a woofer/horn type leslie (122/147), but this is the only one that even gets close to sounding like a Leslie 16 / Fender Vibratone. Now, to the bad points. First off, the pedal has a nasty volume boost, even with the ”drive” knob at zero. Including a small amount of overdrive can help you get closer to the real sound, but this is way too much. Especially since there’s no provision for setting the output volume compared to the bypass level. Unless you plan on keeping the pedal active at all times, the pedal needs to be modified. Luckily, there is a relatively easy mod here, which you can do yourself if you feel confident enough. If not, you can take it to someone to have it done – it shouldn’t be too expensive. It is definitely worth it – after the modification, the output level is at unity gain when the ”drive” knob is at zero. If you need a little more push to your leslie, just give it a little drive. Why Danelectro chose to ship the pedals the way they are – and continue to ship them this way – is beyond me. Another drawback is the miniature plastic casing – it is so small, that hitting the switches with any sort of accuracy requires one to take off their shoes, using the big toe to prod the switch. I’m not joking – that’s the only way I’ve been able to work it… And even with the shoes off, the switches need a good prodding to actuate, which means that you can’t be 100% sure the thing is actually going to change speed (since there’s no LED to indicate speed status). On my (ever-growing) to-do-list, there’s now an entry about rehousing the circuit into a bigger, sturdier box. But all in all – if you are looking for a decent single-rotor leslie sim, it does a fine job indeed. Thumbs up for Danelectro! Now, can we have it in a bigger box, please?